3. 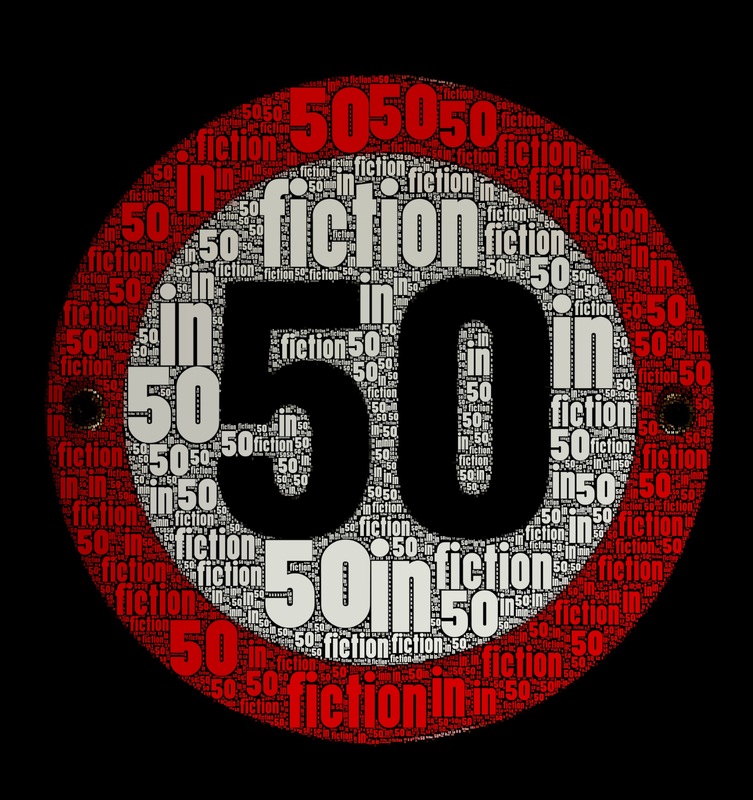 Add on of the nifty little pictures above to your post (credit for which goes entirely to ideflex over at acrossthebored.com) or create your own Fi50 meme pic…. At this time, I haven't been able to find a source for a free linky-list, so it's just comments. 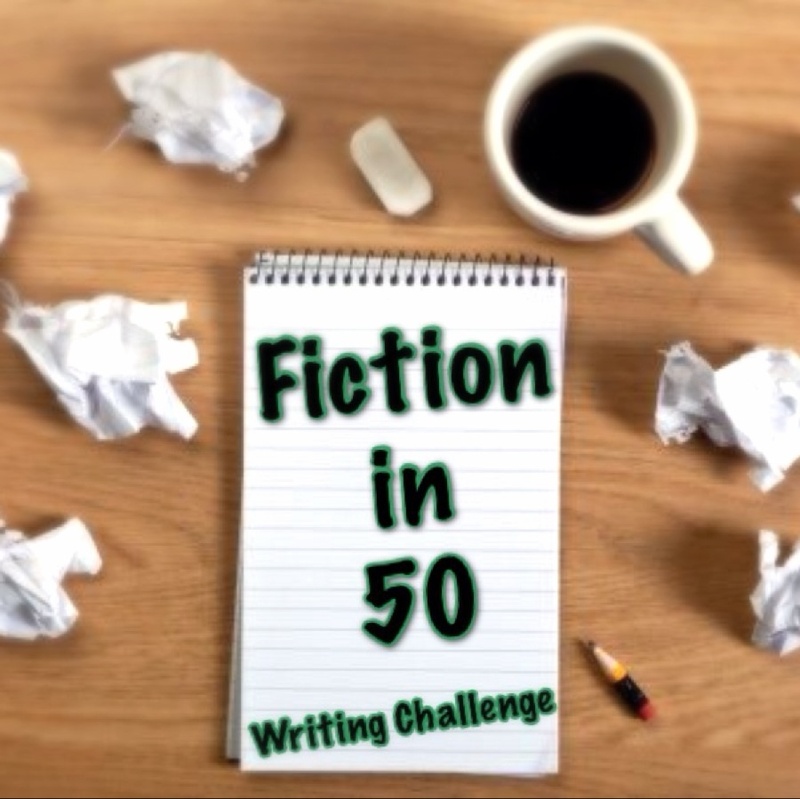 I recommend posting your basic blog link below, with the day you post your Fi50 story. You can also add a link in the comments on my story, posted the next-to-last Sunday of the month. Feel free to Tweet using the #Fi50, though I'll not lie: the Ninja Librarian is a lousy tweeter. 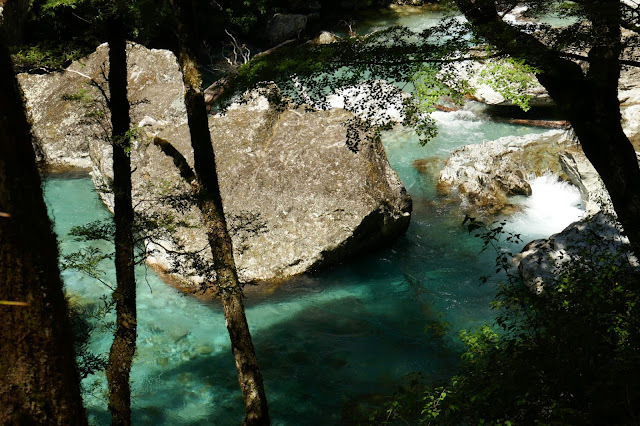 I will do my best to visit if you post, but the first half of 2019 I will be away from the computer a lot, so be patient! The February prompt is “No more hearts and flowers.” Make of it what you will! And now for my Fi50 story. I am so over him. He wasn’t that great anyway. I suppose I’ll miss the chocolates and the flowers, but I’d rather choose my own. Admit it: you’re secretly glad. Anyway, who gave the little snot permission to go around shooting arrows at people? All I did was shoot back. Bet you thought I’d forgotten :). Only almost, but it’s not too late! I look forward to seeing what you make of it! Let me begin with an apology: I shouldn't even post this, because as I do so I'm heading out again for 9 days and will have limited chances to visit other posters. If you want to skip me because of that, I understand. If you comment anyway I WILL read your story--it will just take me a week or two. Twenty-eight days isn’t very long. Twenty-eight days is an eternity. Sometimes it’s both at once. It was February 1st when I was given one month to meet the love of my life. To make it worse, I had to start from scratch, since I hadn’t had a date in longer than I wanted to admit. I got lucky on the 3rd—I ran into my high school sweetheart at the Pac-N-Save (in the baking aisle, if you want to know. I was buying chocolate chips; I think he was lost). We chatted, and he was still single, so time being of the essence I set to work. Flirtation has never been my strong suit, but I made a point of exhibiting an unwarranted enthusiasm for his company. You probably wonder how I ended up in such a mess. It was, as usual, thanks to my fairy godmother. She has a wee drinking problem, to use her slurred words. When she heard me lament that I hadn’t had a date in ages, she tried to bless me with a promise that I’d find the love of my life by the end of the month. Alas, she wasn’t quite sober, and what came out was more of a threat: “You must find your love,” etc. The “or else” wasn’t explicit, but it would be bad. That’s what she said when she sobered up and discovered what she’d done. That’s why I was trolling for love in the Food4Less, and why I was prepared to be satisfied with my high school sweetheart, even though he was kind of a conceited idiot back then. He still was, but I tried not to notice. Love conquers all, right? I had my work cut out for me. In addition to my own inner resistance, I had to overcome whatever it was that made him dump me the night before our Senior Prom. Over the next few days I contrived to bump into Brad just about everywhere except the men’s room. I knew I was making progress when, the second time I ran into him on the 6th, he asked me to go out for coffee with him. Unfortunately, once we were seated with our lattes, he asked me if I was stalking him. I don’t think he completely accepted my explanation about a new job that seemed to be sending me to all the same places he went. But he did agree to see me again, so I counted it as progress. It might have simply been his ego—it was so easy for him to believe a woman was chasing him. The hard part for the next week was coming up with reasons why we should go out. Every. Single. Day. That, and keeping my smile pasted into place while he talked on and on about himself. I must have succeeded, because Brad began to come around to my place without me even asking. It looked like I’d dodged my Fairy Godmother’s drunken bullet. I still had ten days left and Brad was eating out of my hand, even starting to drop hints about a ring. There was only one problem. I didn’t really like him. In fact, I really didn’t like him (there’s a big difference). Would it break the curse if I married someone I didn’t love? I asked my FG, but all she said was, “Hand me another beer, dearie.” My uncouth Fairy Godsot drinks Bud Light. I was left with a dilemma: I’d not found anyone better than Brad, and while I didn’t exactly consider him my ideal man, he seemed to be getting genuinely fond of me. Anyway, he was my best option. My only option, actually. Brad had to go out of town for work, and I spent the next three days debating if I should lure him on to the proposal I needed. When he got home and called me, I told him I had a migraine and couldn’t go out. I agonized all night over that decision. I spent the morning of the 20th with Brad, who bored me to death. He assumed I was pale and listless because of the migraine I’d not had the night before. That evening I cruised singles bars with my BFF, flirting with everything male. She kept asking, “What about Brad?” She knew all about him, but I couldn’t tell her about my Fairy Godsot. On the 22nd I turned down Brad’s proposal. He was justifiably furious at the way I’d led him on. I didn’t try to explain, not that he gave me the chance. I spent the 23rd to the 26th imitating the FG: I bought a few of boxes of cardboardeaux and stayed drunk the whole time. I called in sick to work, planning to drink until the sky fell March 1st. My boss showed up on the 27th, worried because I’m never sick. Nor do I get drunk, so when he saw the wine boxes, he knew something was very wrong. I groaned and rolled my eyes and cussed some, but he didn’t budge. I could see it all: he was going to try to set me up, and it would be another Les, the sexist pig from Accounting with wandering hands. “It’s my nephew, Donal,” my boss added. Why would he set up his own nephew with a doomed drunk? The kid must be odious. I wasn’t going to get myself hooked up with a Les, or a pimply youngster either, but I pulled myself together and the boss drove me to the office. He didn’t say anything more about his nephew, and I guessed he’d be a mess. Donal was no Les, and he wasn’t a mess. Thirteen-year-old Amethyst does not get on with her teachers. Her classmates think she is weird. She prefers to be on her own, and she wishes she did not have to go to school. Amethyst reads detective stories, collects fossils, loves archaeology, and is writing her own dictionary. She has trained herself to become an expert in tracking, searching and following clues, and she uses these detective skills to search for someone who was murdered seventy years ago. Amethyst reaches out across time and space and in doing so finds her own voice among the many meanings of silence. I picked up this book because it seemed to fit a theme being explored on the Goodreads group Great Middle Grade Reads; i.e., girls in science. To some degree, that is true, as Amethyst is definitely interested in archaeology and geology. She is also dealing with a history of selective mutism (oddly, this is the second book I've read recently dealing with that--not sure what's up with that!). In the end, I'm not sure how to classify the book, nor exactly what I thought of it. It deals with identity, with having a sense of self, with history, and with memory--in this case, remembering victims of the Holocaust. It also deals with the struggles of an extremely intelligent girl with an unusual upbringing to integrate into a normal school setting, which not surprisingly doesn't go well. I do wish that books like this could maybe not have so many clueless teachers, but at least she does find one who is willing to meet her where she is and go on from there. I did like that she's very bright, and doesn't end up having to be forced into behaving like other girls (the author doesn't even try to pretend that deep down all girls like that stuff, which too many books do, I think). And the story was engaging, so that I read through a lot of it in a single go (and not just because I was reading it on the plane). Because of the Holocaust elements, I'd recommend for 10 and up--old enough to deal with what Amethyst discovers about the person she is researching. It definitely has the potential to open up some interesting discussions, as well as just being an enjoyable read. 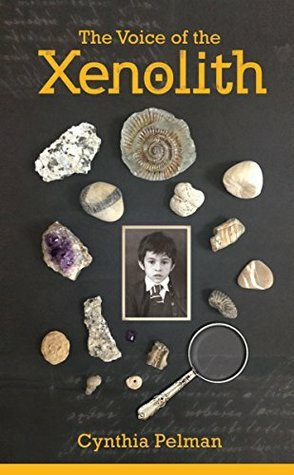 Full Disclosure: I borrowed an electronic copy of The Voice of the Xenolith from my library, and received nothing from the author or the publisher in exchange for my honest review. The opinions expressed are my own and those of no one else. I am disclosing this in accordance with the Federal Trade Commission's 16 CFR, Part 255: "Guides Concerning the Use of Endorsements and Testimonials in Advertising." It’s way past time I started getting some photo posts out to you all, since I’ve been busy taking pictures of some of the most scenic landscapes around for over month. (See the post on Mt. Cook)! 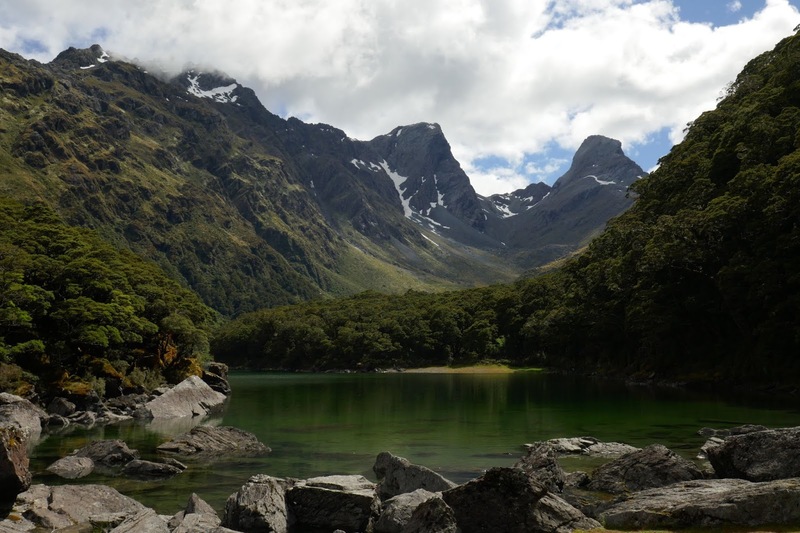 Our first major hike (tramp) back in early January was the Routeburn Track, where nothing quite went as anticipated. 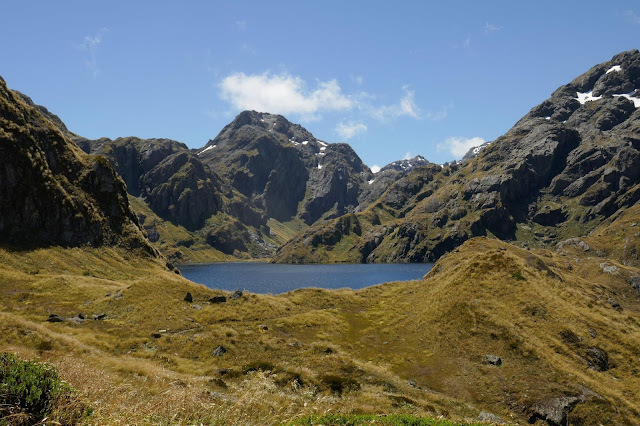 The trip began promisingly, with reasonable weather and some good views as we climbed toward Lake Howden Hut, taking a detour up to Key Summit on the way. I always like a room with a view! Our first hint that something was wrong came not so much when our son didn’t want to do the side-trip, as when he reported on our return that he was shaking and couldn’t get warm—on a day that wasn’t particularly cool. 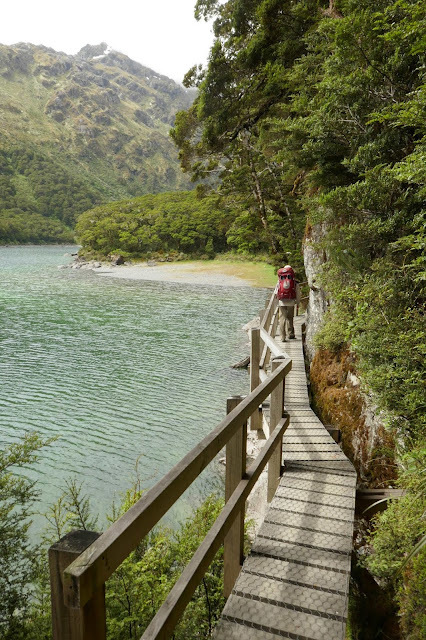 We walked another 15 or 20 minutes to Lake Howden to eat lunch, where I confirmed that he was running a fever (I know—I should have checked that when he first mentioned it). We fed him ibuprofen and he took a nap in the sun, and eventually declared himself able to go on. This was a tricky decision, because of the distances involved and because of lodging issues. Our huts/campsites on the Track were booked and paid for. If we backed out, we had no idea where we could find lodging; it has become very difficult to get a room in the popular areas of Fjiordland. Since our son felt better, we went on to where we at least knew we could spend the night. The hike to McKenzie Lake, about 8 miles, took us until mid-afternoon, including a stop at the very scenic Earland Falls. 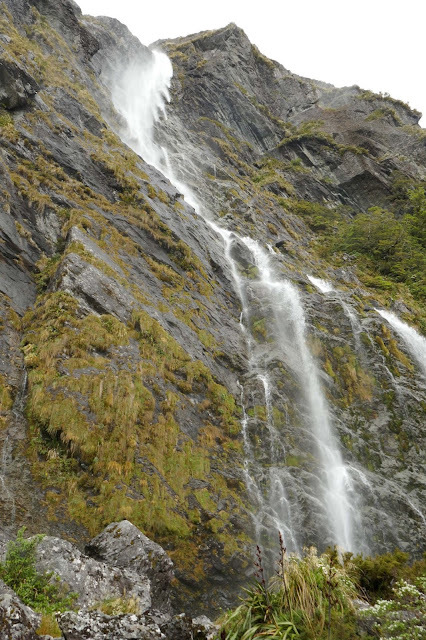 At 175 meters the spectacular fall lands more or less on the trail, forcing detours in heavy run-off and putting cameras at risk from the spray. 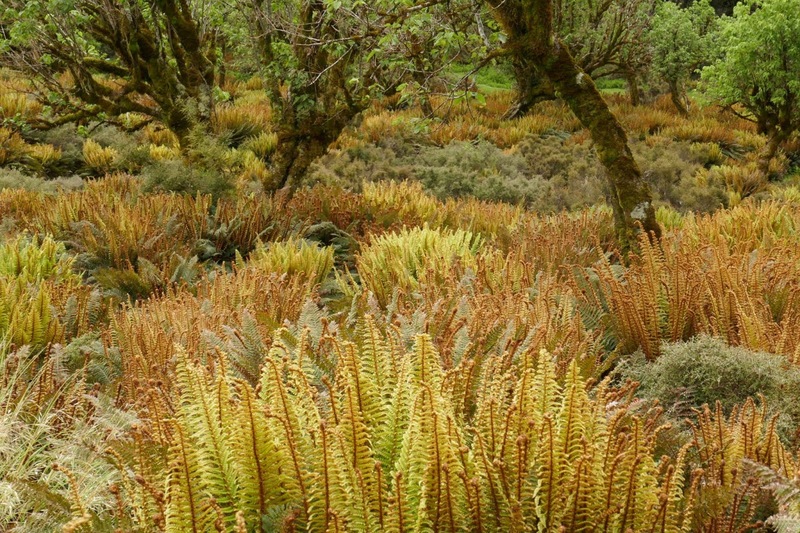 An area called the Orchard featured views, scattered trees, and a fantastic fern collection. Arriving at the lake. The trail to the campsite took a little engineering. Our first night at McKenzie we were camping, and as soon as we had tents up, our son crawled in and went to sleep. He didn’t budge much for the rest of the day or night, except to eat a little—and to be sick. That was when we went to the hut warden and explained that we didn’t think we’d be able to move on the next day, which should have been another 8 or 9 mile day up over Harris Saddle. The plan was to do that on the second day of our trip, then return to McKenzie for the third and final night. Instead, we spent the next 2 nights in the hut, and my husband and I dayhiked a bit, toward the saddle and up the McKenzie valley. The fact that the weather closed in and it rained much of those 2 days reconciled us to the loss of our scenic crossing of the divide. It was cool to walk back down the trail and see the change in the creeks and falls as the rain drained out of the high country. The rain does make the place. I'm pretty sure this was Middle Earth. By the time we got high enough to hope for views, we were deep in the cloud. The time in the hut allowed our son to recover enough for the hike out on the 4th day, and even to join us on a hike up toward the saddle again because the rain had stopped and there were signs of clearing. 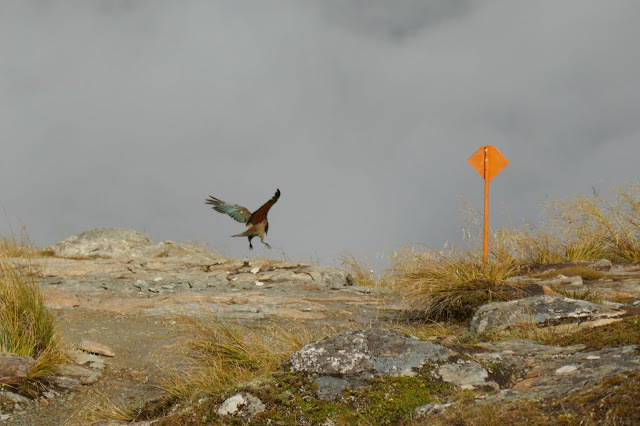 There we saw only glimpses of mountains, but encountered a flock of kea (alpine parrots) performing for us, a worthwhile trade-off. The orange pole is a route marker. The kea has orange splashes under its wings, though I wasn't able to capture them. We were able at last, just before leaving, to get a good view of the lake and the valley beyond. We also had a few cooperative birds. 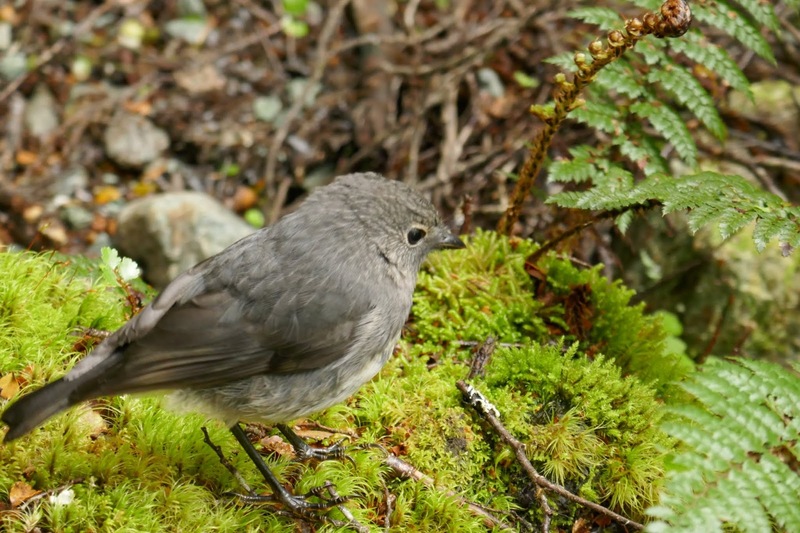 New Zealand has no land mammals, and is famous for the bird life. That has taken a hit since humans came to the islands 1000 years ago and began bringing in predators and competitors, but the collapse of the avian population has been especially noticeable in recent decades--even since my first visit in 1996. 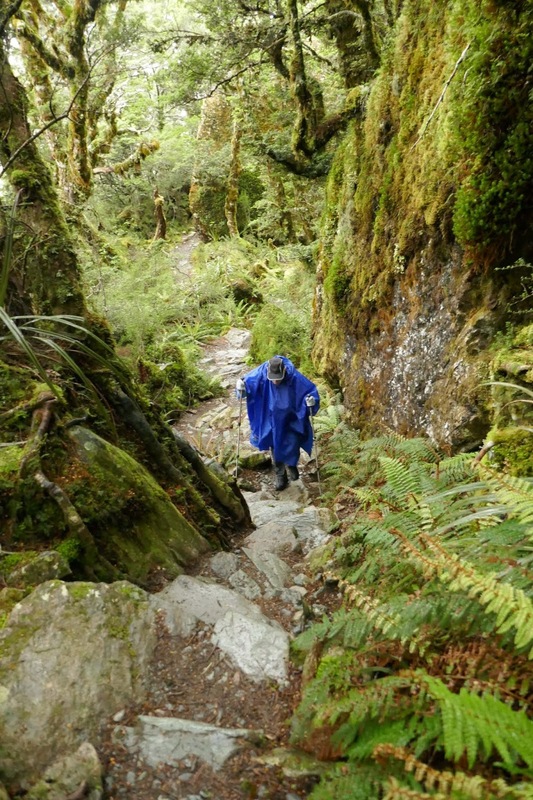 It was good to see an aggressive predator trapping program in many areas, including along the Routeburn Track, and to observe that it was beginning to have an effect. Feeling a bit frustrated by this failure to get to the most scenic part of the route, my husband and I made a return several days later (after we’d hiked the Hollyford Track) and dayhiked to Harris Saddle from the other side, a hike of about 17 miles and some 2700’ up and back down. On that day, the weather was perfect, and the hike more than worth the long day. We began by following the Route Burn up to Routeburn Flats, a good climb but made easy by a very smooth and well-graded trail. Glacial run-off gives all the lakes and rivers their distinctive green color. After the Flats another hour of serious climbing took us to the Routeburn Falls hut, where we would have stayed. The view from the porch was impressive, to say the least! 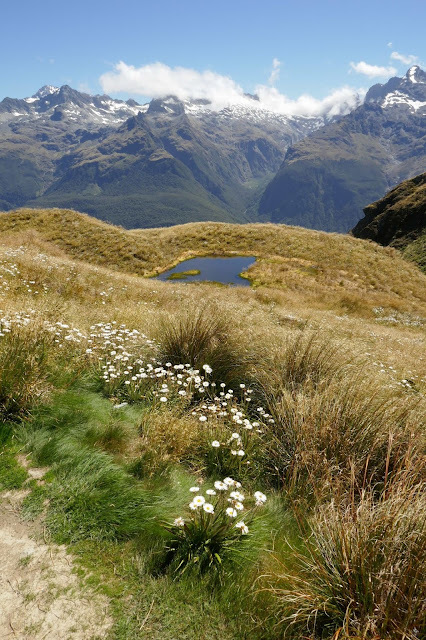 The view from the Routeburn Falls hut, with the Flats below. But there was more. 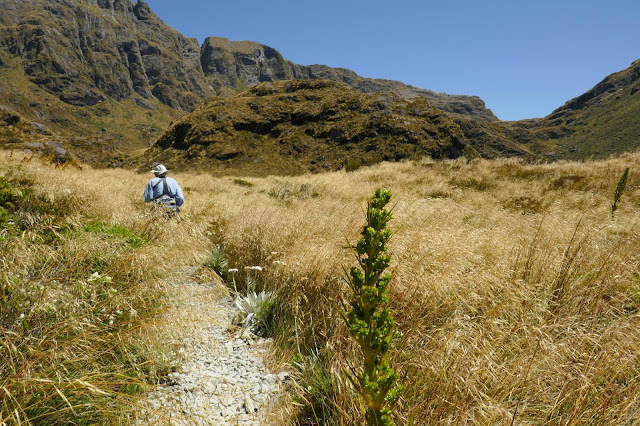 After admiring the falls, we continued up to Harris Saddle, painfully aware that while we had plenty of daylight for the hike, we were going to return to our camp in Queenstown very late indeed. The views of and from the final climb were well worth the fatigue. Climbing toward the saddle. Notice that the trail is no longer perfectly smooth and 4' wide. We went just far enough over the saddle to get the views of the Darren Range and the Hollyford Valley, where we had just been. 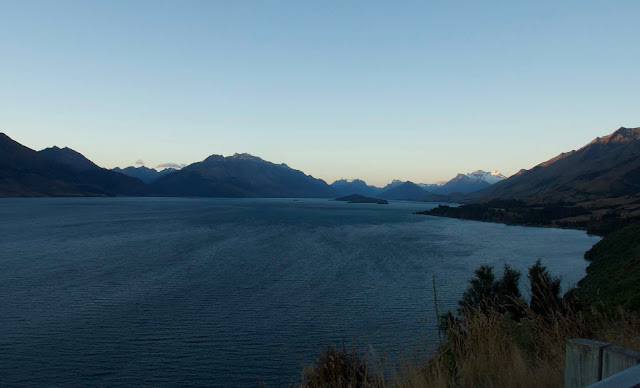 Thanks to the very long midsummer days, we enjoyed the drive back to town along Lake Wakatipu in the dusk. Hope you've enjoyed this quick report! Now that I've figured out how to get full access to my blog (visit the library), I'll be getting more reports up soon! Publication Info: Listening Library, 2018. 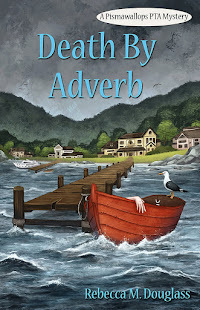 Hardback by Nancy Paulson Books, 2018. 192 pages. This was a book that announced from it’s opening line that it would be dealing with issues. That can be off-putting, but in this case, it worked well. A lot of the issues had to do with race, and with being Black in America (another character is dealing with fear of deportation, another hot-button race issue). Part of why it was so powerful, I’m certain, is because the author is African-American, and has had to have “that talk” with her own 10-year-old son. No, not the one we all have to have. The one where you explain why he can’t have a toy gun any more, or wear a hoodie in public, and how to act if the police come near you. To make it more real, the cast reading the book included that son, as well as either another son or a friend (I couldn’t quite get that clear listening to the fascinating interview at the end of the book). The young voice actors did an amazing job, and I was surprised to find they were such young kids. Back to the story... the kids in the book are all supposed to be “different learners,” but I felt like that was just a device to explain such a small group with the freedom to have the conversations that the book records. They don’t in fact seem to be struggling with any learning disabilities, and maybe they aren’t. The narrator, Haley, is dealing with an incarcerated father, and the other part of the story hinges on why he’s in prison, and why she is being raised by her uncle—and what happens when her father finally comes home. Woodson has a very real and powerful voice as a writer, and the audio version was fantastic. I can recommend it, and think those kids who voiced the children in the book did an amazing job. This is suitable for kids from about 9 up, and lends itself to discussion about some serious issues facing our country today. In fact, I think some of the issues raised almost require some discussion with young readers, so I might recommend it for a class read or a family read. 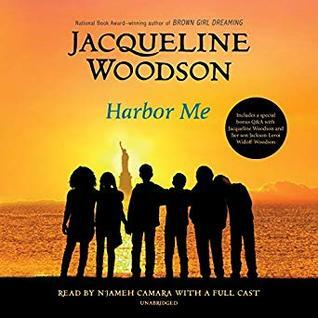 Full Disclosure: I borrowed an electronic copy of Harbor Me from my library, and received nothing from the author or the publisher in exchange for my honest review. The opinions expressed are my own and those of no one else. I am disclosing this in accordance with the Federal Trade Commission's 16 CFR, Part 255: "Guides Concerning the Use of Endorsements and Testimonials in Advertising." I'm not really here to talk about writing this month. We just spent the month of January hiking our backsides off (kind of literally—my pants do fit better now than they did right after Christmas), so it should come as no surprise that I haven’t been writing. Nor have I been reading much, at least not much with substance. A kind of goofy children’s book. A couple of re-reads of light mysteries, and, heaven help me, a Louis L’Amour western (these have special nostalgic significance for me, as when I was in Jr. High and high school I read them like candy, buying far more of them than I should have from the paperback rack at the local grocery store because the library’s didn’t keep up). I am currently working on a rather massive Kim Stanley Robinson alternative future. One nice thing about all that: with the exception of one or two of the children's books, I'm not reviewing these books. That means I can really relax and just read for fun, which is part of why I love re-reading. Here’s my excuse: sometimes your brain needs a vacation. Sometimes you are just too tired to do anything that requires real thought, including reading. Sometimes, when you feel that way, you watch TV. I don’t, for two reasons. For one, I don’t really like TV that much (this is related to my issues with prosopagnosia, in part, since I can’t keep track of characters well). For another, most of my reading was in back-country huts and motor camps around New Zealand, so TV wasn’t really an option. But give me a half hour with WiFi every week or two or three, and I can keep my e-reader loaded with the most amazing stuff (and nonsense). So here’s a shout-out for reading junk, and here’s a promise that I’ll be writing this month (I’ve already gotten back to work, though we’re headed into the wilds again for a few days tomorrow). I have three things I want to do this month: finish and post my WEP story, which I did manage to draft while swatting sandflies in a hut on the Routeburn Track; finish a short story using my Pismawallops PTA characters and see if it's usable anywhere; and start revisions on the novel I drafted in November and December. I may even drop the short story to start this, since I'm not sure that story is going anywhere--maybe the right way out will come to me if I leave it alone for a while. 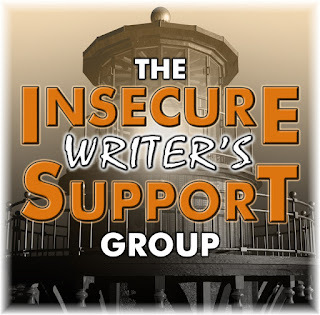 So--tell me about your creative outlets, or confess your literary guilty secrets! I didn’t know what to make of this book at first. The idea of a 12-year-old riding a bike across the country alone was intriguing, but unlikely. That she’d been raised by Mostly Silent Monks gave me my first clue that “absurd” was an okay way for this story to be. 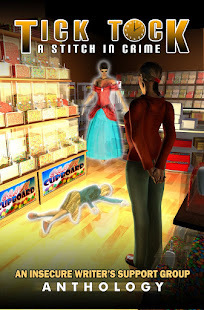 It’s a testament to what a good author can do with an absurd premise to make a real point. Bicycle is launched on her adventure because she needs to make friends. Her guardian thinks that she needs the services of “The Friendship Factory,” which guarantees a kid will make 3 new friends at their camp. Bicycle wants friends, but she doesn’t want the kids on the bus to camp. It’s evident from the beginning that this is a case of the kid knowing more than the adult, and seeing more clearly. Bicycle’s idea is a long shot—to attend the Blessing of the Bikes in San Francisco and ask the cyclist, Zbig, to be her friend—but at least she knows you don’t make friends in a factory. And it turns out that she kind of has a gift for friendship, though it takes her a while to recognize it, and Sister Wanda even longer. I was a bit bothered by the way the author played fast-and-loose with geography in places (maybe all over, for all I know—I only know the geography of the West well enough to catch her). Bicycle's entry into Yosemite from the East is really an entry from the West, and I almost laughed when Bicycle rode right into the campground in the Valley and got a campsite (yeah, you need reservations). And, of course, the laws of conservation of mass and energy don't seem to hold in places. Anyway, in the end, none of that mattered, because it was just a fun story with a strong message about being yourself and letting friendships happen. A fun read, and a good reminder for readers of all ages that it's better to be yourself than to try to be someone else's idea of who you should be. 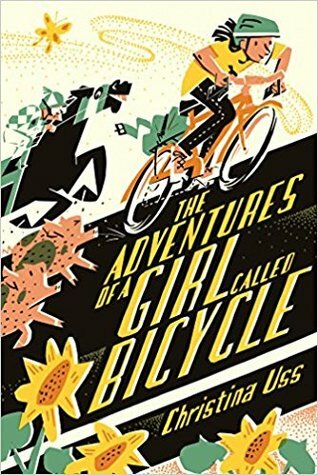 Full Disclosure: I borrowed an electronic copy of The Adventures of a Girl Called Bicycle from my library, and received nothing from the author or the publisher in exchange for my honest review. The opinions expressed are my own and those of no one else. I am disclosing this in accordance with the Federal Trade Commission's 16 CFR, Part 255: "Guides Concerning the Use of Endorsements and Testimonials in Advertising." Since I’m not really even sure what day it is, let alone what month, I’m going to toss out a Flashback Friday today (which turns out to be Friday where I am, though in fact the first of the month, not the last—I know this thanks to the calendar in Blogger). I decided to take a quick look back at my first year of blogging, and stumbled on this post that still seems relevant in most ways. I've been catching up on some through-hikers I was following last summer. For those of you who aren't backpackers (in the US sense, not the European sense), through-hikers are people who hike an entire long trail (Pacific Crest Trail, Appalachian Trail, etc.) in a single season (well, more like 3 seasons, starting very early in spring and continuing until they arrive at the end or snow gets too deep to manage, whichever comes first). I'd been following a couple of PCT hikers, and got distracted, so I went back yesterday and read the blogs all the way through, since they were all off the trail by late October. I don't know if this sort of thing is meant satisfy my desire to do a long hike, or feed it, but that's a post for another day. What I wanted to talk about was the concept of a "Zero" or "Zero Day". A day in town or camp when you don't hike anywhere. Zero mileage. When you are trying to cover 2660 miles between late March and first snow in the North Cascades, you think a lot about miles (you also think a lot about miles between food drops, since taking a day too long could mean a day without dinner, not something you want to consider when hiking 20-25 miles/day). Spending a whole day without gaining any miles can be hard. What I got to thinking about this afternoon is how hard it is for me to take a Zero, to stop doing all the things I'm supposed to be doing. Now, granted that on those "Zero Days" the hikers usually kept plenty busy--laundry and shopping and eating as many meals as they could jam in--in a sense they didn't do any of what they were there to do, i.e., hike. That's the beauty of a Zero. Just don't do it. Maybe that's behind the old religious prohibition on doing any work on Sunday. If we humans don't know enough to take a rest day when we need it, maybe we need an outside force telling us to, before we burn ourselves out. Around here in the U.S. we've pretty much forgotten about that whole Day of Rest thing, but I'm old enough to remember when very very few stores were open on Sundays, and most people (except ministers) took the day off. Everyone took a Zero and was the better for it (eventually my Mom stopped cooking on Sundays, too, though not for religious reasons. She just needed a day off). So today I really haven't done much. I finished two books last night, and read another clear through today. It was past time for me to do that, and it meant, as much as anything, getting the heck off the internet (where I'd been all yesterday afternoon, reading about through-hikers. . . ) and just reading a book. But I was also feeling pretty guilty. Not doing any writing, not cleaning up the post-holiday mess, just indulging myself. Like I did when I was a kid--curled up with a book for hours. But here's the thing: on my "Zero", when I'm kind of beating myself up for not doing anything productive, I have puttered at a number of minor kitchen chores, baked a batch of bread, done a load of laundry, finally pulled out my dead and dying tomato plants and spaded compost into the beds to rot the rest of the winter in preparation for the spring planting, and cleaned up the mud I tracked into the house afterward. See what I mean? I'm not too good at taking a Zero. Okay, yeah, I can take a day off from writing, especially the revisions I'm supposedly working on right now, all too easily. But the rest of my job is that of chief housekeeper and I can't seem to let it go. But the thing is: if the hikers don't take a Zero now and then, they break down. The body just won't keep it up, the mind wears down. Next thing you know, you've left the trail for permanent, not just for a day. 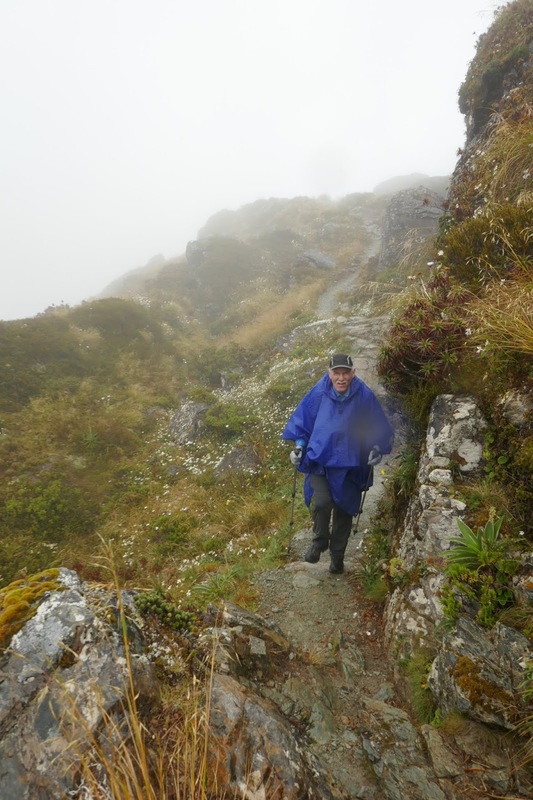 Now, I've a hunch that "trail fatigue" might happen to writers, too. Take a break or get the boot. I'm not so sure about housework, but I do know that a) it will never go away, and b) it will never go away. It'll still be there tomorrow. Take a Zero. Read a book and let the dust bunnies thrive one more day.